A cha-cha bowl at Orlando’s Caribbean BBQ courtesy of The Travelling Hungryboy. Over the past week or so I’ve detected a whiff of fall in the air, which always makes me a little melancholy. Days are getting shorter, and nights are becoming chillier… except in San Francisco, where the exact opposite is true. Even so, in clothing chains all over town, corduroys and wool sweaters in warm autumn shades have replaced flip flops and linen shorts. Where did the time go? The end of summer 2013 is especially blue for me as a baseball fan. The San Francisco Giants – currently occupying the cellar in the National League West – have no chance of repeating last year’s World Series run. And the Cleveland Indians are seven games out of first place in the American League Central, which means my dream of a Giants/Indians October throw down will have to wait at least one more year. Over the weekend, I caught two of three games in the Oakland Athletics vs. Cleveland Indians series across the Bay. Unfortunately/naturally, the game I skipped was the only game the Tribe won. It was fun to see the Indians in person for the first time since spring training, but it was tough to sit silently as Oakland fans celebrated being only .5 games out of first in the American League West. Having spent 2010 and 2012 cheering the Giants to the World Series, losing smarted. I did not enjoy it… but deep down I’m happy for the As. They are a talented, scrappy, underrated, red-headed-stepchild of a baseball team, with a crummy, dilapidated ballpark. Today I picked up a couple of Giants tickets on StubHub, at bargain basement prices (relatively speaking). 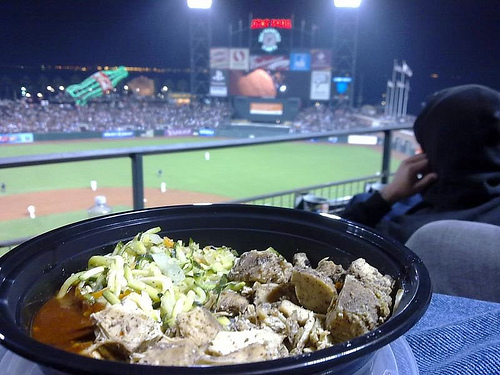 Even though the team is zapping my strength, come October I’ll long for “summer” evenings at AT&T Park, wearing a ski parka and using a cha-cha bowl as a hand warmer. I’ll fill the void with the NFL and the NBA, but I’ll really just be going through the motions – at least until the first winter storm drops buckets of cold rain on San Francisco. Until then… some photos from my bittersweet weekend.